Where: On any road where slow-moving vehicles could disrupt the traffic flow. 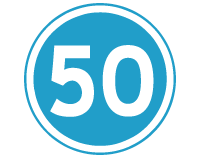 Purpose: To regulate the minimum speed of traffic. Action: Do not drive slower than the speed indicated in km/h.